Last week 48 year 7 stu­dents took part in a day of explo­ration and arts & crafts mak­ing at Kings Wood in Ash­ford. This was an amaz­ing oppor­tu­nity for our pupils to expe­ri­ence art and craft in an out­doors envi­ron­ment. 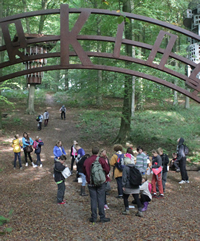 Pupils par­tic­i­pated in an artist led walk, view­ing and expe­ri­enc­ing the sculp­tures within the woods. Pupils then worked in teams to build and cre­ate habi­tats for wood­land crea­tures. It was a fan­tas­tic expe­ri­ence and the pupils par­tic­u­larly enjoyed the ‘cre­at­ing’ activ­ity work­ing in teams to real­ize their ideas. Our pupils demon­strated their car­ing and thought­ful nature when they were con­fronted with an unex­pected event. 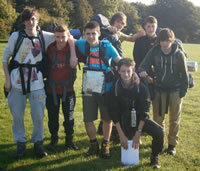 Com­ing across an injured dog in the woods, our pupils alerted their guide. The dog, who had been miss­ing for a few days, was soon reunited with its owner. A great day had by all, well done year 7. On the week­end of the 5th and 6th Octo­ber, 35 brave and hardy Year 11 stu­dents suc­cess­fully com­pleted their Duke of Edin­burgh Award Bronze expeditions.They showed excep­tional nav­i­gat­ing skills on the first day to get lost so often and yet still man­age to get to the camp site at Kings­down before night­fall! Day two was much bet­ter and a big thank you to the three asses­sors we had who worked tire­lessly to sup­port the stu­dents. Well done to all the students! The 3rd Octo­ber was National Poetry day and in the run up to the event, stu­dents took part in a National Poetry Day com­pe­ti­tion. This year’s theme was ‘Water’. Many stu­dents entered the com­pe­ti­tion and in the end it was a close call between 1st and 2nd place. I was incred­i­bly impressed with the qual­ity and orig­i­nal­ity of the poems that were entered. An extremely tal­ented Tar­ren Brath­waite (from Year 11) was awarded first place with his poem “Safe place to cry” and gained 20 house points. In 2nd Place was Danielle Cor­ner and third place was year 7, Jas­mine Gib­bons. Well done to all stu­dents for tak­ing part! Win­ner of the Y7 cross-​curricular home­work project in July was Mol­lie Edmead! Mol­lie won the ‘Key to KES’ which gave her a VIP day at the start of Y8, choos­ing any lessons she wanted, wear­ing non-​uniform and hav­ing a free break­fast and lunch of her choice. Mol­lie vis­ited lessons from Y13 Per­form­ing Arts, to Y10 Art and Design to Y7 Cre­ative Design! Well done Mollie! On Fri­day 27 Sep­tem­ber I was invited to the for­mal launch of Demen­tia Diaries. It is a book writ­ten by young peo­ple, pri­mar­ily for young peo­ple but it is an infor­ma­tive read for all ages, to help them cope with a loved one who is suf­fer­ing from demen­tia. The for­mat is easy to read, it is funny and sad in places but it does show the chal­lenges of car­ing for some­one with demen­tia. There is also a YouTube clip called ‘The brain cell boo­gie’ to sup­port the launch of the book. 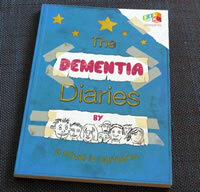 This book is avail­able in all schools and libraries in Kent. One of our ex-​students Raisa is a main con­trib­u­tor, giv­ing her account of help­ing to care for some­one who has demen­tia. West­gate is becom­ing a demen­tia friendly town. I was priv­i­leged to have been invited and it was fan­tas­tic to see an ex-​student involved in such a worth­while cause.